So glad you stopped in. Please stop in often. as new art will be posted on a daily or weekly basis. I am also a professional songwriter, so please feel free to check out my music. Just click on the link. It is my belief that truly fine art need not be expensive. To this end my focus is producing incredible works of framed art for only $20 Most of my work is reverse painting on glass, however new ideas are always being tested. No matter what each masterpiece measures 2.5 inches x 3.5 inches. Frame stands up or have a magnet. I do some large pieces and will post these as time permits, but they are VERY expensive and sold by appointment only. Due to the delicate nature of glass, pictures will be sent via US Priority mail or UPS in a sturdy box. The cost to post the box is $8. This fee is ONLY charged if you order a single picture. After that, shipping is free. In 2014 I discovered reverse painting on glass. I spilled some paint on a piece of glass. The next day when I turned the glass over, I was immediately taken by the beauty, clarity and depth the color. That was the day my journey began. Since then I have developed dozens of unique methods of applying colors. My works are not limited to just paint. I also use iridescent and color shifting pigments, as well as holographic elements, pure 24k gold leaf, copper and silver leaf, naturel Abalone, and Mother of Pearl shell. 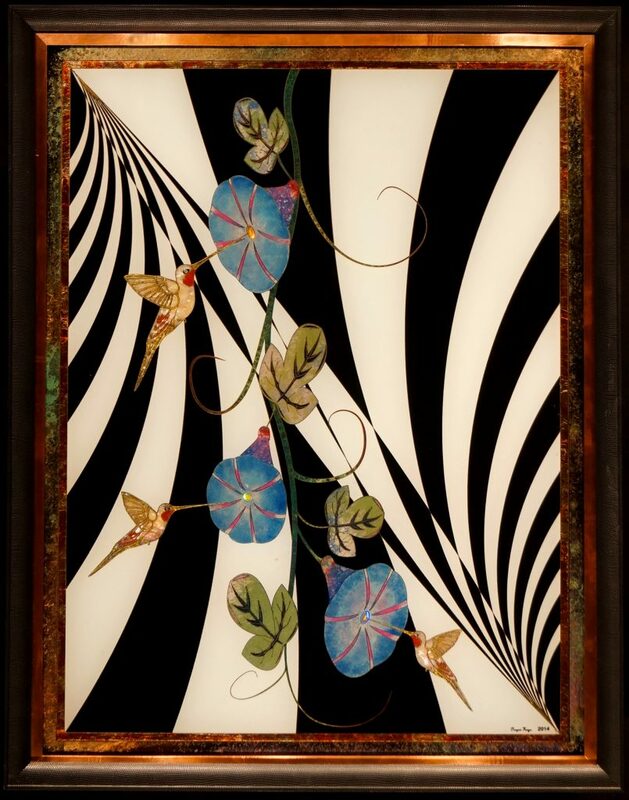 Images are formed on a computer, then engraved into the glass, hand painted and embellished, signed in gold. The process allows me to make works so detailed, you want to look at them with a magnifying glass.